The VOE 2013 $20 Challenge raises over $15,000! to our Annual Twenty Dollar Challenge. In today’s economy, it is extremely difficult to raise funds. rather than a lot from a little. just over $15,000 from 139 individuals, families and businesses! and families in the Nazareth Area School District. Since October 2008 we have provided over $127,000. for every dollar contributed, ninety-five cents is utilized to help others. As we have no paid staff, only 5% is required for operating expenses. your kind support of our Foundation. We had another successful Visions of Joy program this year! We provided gifts to 29 families with 77 children and more than $2300 was spent to purchase their three gifts. Boscov’s did another wonderful job this year by providing wrapping services and special sales for our program. BJ Toys also donated stuffed animals and several other toy donations were received. Thank you to everyone who helped make this Christmas special for these families! 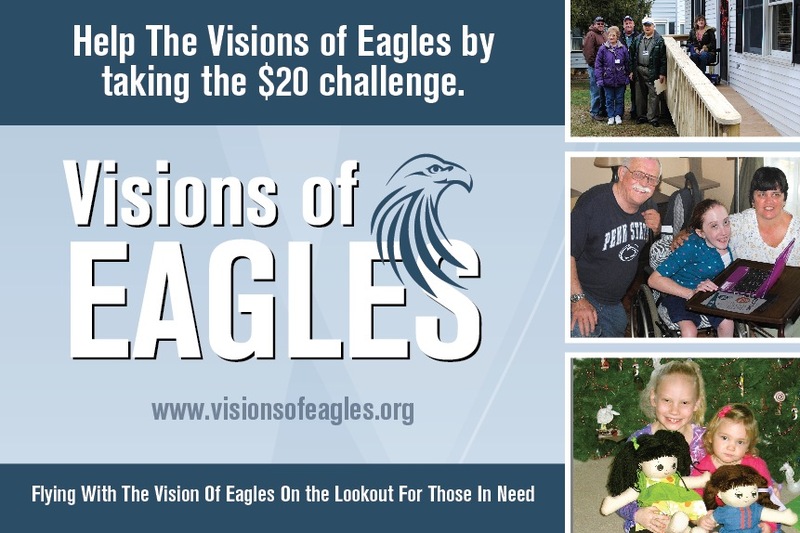 The VOE $20 Challenge Raises Over $6,000! In early November, our Committee mailed these postcards to residents of the Nazareth School District, friends, acquaintances, classmates and business owners challenging them to make a $20 (or more) donation to VOE. Our requests for help were overwhelming in 2012 and we expect this to continue in 2013. We are thrilled to tell you that the $20 Challenge raised over $6,000. The Visions of Eagles Committee has decided that this challenge will be one of our annual fundraisers. A heartfelt THANK YOU to everyone who donated to this challenge. Your donation will assist us to continue to help those in need in YOUR community. Thank you everyone who attended our dance! Bushkill Township Fire Company was packed and the dance floor was never empty! It was one of our most successful fundraisers and we want to thank everyone who helped make it a success! Mark your calendars for April 20, 2013. “Desire” will be back at the Fire Company and we already have lots of reservations! Call any VOE member to make your reservations now! Check out our gallery for pictures of this great evening! 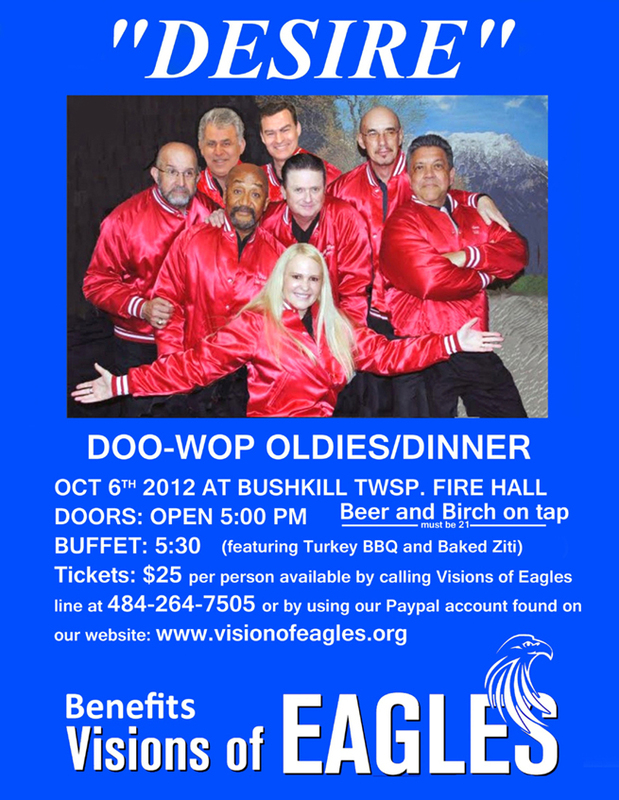 Visions of Eagles is very excited about our October fundraiser which is a presentation of the popular DooWop/Oldies singing and musical group “DESIRE”. This event will be held on Saturday, October 6th at the Bushkill Township Volunteer Fire Company Social Hall at 155 Firehouse Drive, (off Bushkill Center Road) at 5 p.m. For only $25 per person you can join us for music, food and beverages and support our Nazareth Area ministry at the same time. Bring your friends and family. You might want to dress in period attire as we will be doing a lot of reminiscing about the old days. We’re sure that many of you have some great memories to share. Anyone 21 years of age or older can purchase tickets by either calling VOE directly at 484-264-7505 or by visiting our ”Donate” tab on our website where tickets can be ordered online by using our PayPal feature. Don’t hesitate to get your tickets as there are less than 250 tickets remaining. To date we have provided almost $90,000.00 in assistance. You will be helping us to continue our giving by purchasing the tickets for this exciting event because a portion of the ticket sales will be donated to VOE. We thank you for your support and encourage you to come join us for a great evening with “DESIRE”. Thank you for visiting us at Nazareth Day on the 21st of July. We will be at Martin on Main on August 4th and will be selling 50/50 tickets, VOE t-shirts and caps and more beautiful prints by our own Darrell Mengel. Stop by and support our important cause! Ann Marie Vaughn, camp director of Camp Invention, attended one of our monthly meetings and did a presentation about the camp which is held in July at the Nazareth Intermediate School. Our committee was very impressed with her program and approved the payment of the registration fees for five Nazareth Area Students. Ann Marie contacted VOE and invited us to attend the presentation of the projects on the last day of the Camp. Four VOE members attended and were extremely impressed with the enthusiasm and creativity of the children and the camp counselors. We were presented with a beautiful thank you booklet which was signed by each student in attendance. Check out our gallery for some pictures of the event! This has been a busy month with our Second Annual Celebration Event held at the Hampton Inn on April 13th. There were 55 people in attendance which included four speakers who benefited from our help. These speakers were Brenda Tigar, Ken Ruppert, Marci Bossard, and Debra Requena who all gave inspirational messages. Other speakers included State Representative Marcia Hahn, Assistant Superintendent Michael Roth and Mayor Luke Duignam from Tatamy. Contributions from those who attended and from many who were unable to attend will enable us to continue to help those in need in the Nazareth Area School District. Since the beginning of 2012, our care giving has exceeded $15,000! The upcoming month of May will feature three events that will benefit our care giving. On May 4th and 5th the Trinity Evangelical Lutheran Church will hold a Rummage Sale to benefit V.O.E. There will be many good values, especially in infant and children’s clothing. On Friday evening it will be held from 5:00 pm until 8:00 pm and on Saturday from 8:00 am until 2:00 pm. On May 5th we will be at the Adult Soapbox Derby in Nazareth on Prospect Street. We will be serving the best hot dogs and snow cones in Nazareth near the finish line at Prospect and Green Streets. We will also benefit from this sponsoring organization. On May 12th we will be holding our own Walk-A-Thon at the Nazareth Middle School Track located between the rear of the High School and the Middle School. We will start registration at 9:30 am. For a $10.00 donation people of all ages can walk the track for as many laps as they want, at their own speed, up until noon. Join us for a brisk morning walk for exercise and camaraderie. We hope to see you there for a fun time and a FREE V.O.E. t-shirt! On Monday, February 27, 2012 from 5-9 pm VOE had a fundraiser at Pizza Joe’s on Main Street in Nazareth! Thank you everyone who came out to support YOUR hometown charity! The restaurant was packed all evening! We had a great time and Gerry is looking forward to another fundraiser in the near future. Many thanks to Gerry and his staff for a successful evening! Check out our gallery for some great pictures! We’ve got a lot of fundraising events planned for 2012! February is an evening hosted by Pizza Joe! We’ll give you more details in the next week. March is a Tastefully Simple party hosted by Deb Rizzotto at Carol Seaton’s house. Contact any VOE committee member if you want to place an order. April is our VOE 2nd Annual Celebration event at the Hampton Inn in Easton and we are working with the school district to plan a walk a thon in May. We will also be participating in the Soap Box Derby again this year held in May. More to follow! Please support YOUR local charity to help your neighbors cross the bridge from despair to hope.